This works beatifully to brighten the under-eye circles and, I daresay, perfoms rather well as an anti-age eye cream. Very good product overall. I love most Paulas Choice products I have tried, but this one was weird to me. It has some sort of sparkle to it? And it feels like it dries out my skin and just sits on top of it, and feels a bit sticky even. It also made my skin look worse, as it looks really shiny. Maybe for other skin types - I have very dry skin. Customer Care: Thank you for your review. We are sorry to hear that this product has not worked for you. You are welcome to contact our Customer Care team for a recommendation. I absolutely did not expect this product to become one of my absolute favorite products. But it has! The product has a very nice texture, which I would describe like a very light lotiony-liquid, yet it's weightless on skin and does not cause any excess oil. I get absolutely no irritation from this product on the contrary it seams to soothe my skin. This has only made some difference to existing post-acne marks/PIH (which were quite bad but now getting better), but it makes new ones disappear quicker and seams to help skin heal from blemishes. It says it "visibly reduces wrinkles" on the front and I was very skeptical about that, but this combined with the other product in my routine (all of which are Paula's Choice product), has absolutely made a noticeable difference in the fine lines, that were beginning on my forehead. I was not going for an anti-aging routine, I just wanted to fade my marks from acne and keep it under control and this was a very nice unexpected benefit. I strongly suspect this product helps with my acne as well and also redness. As far as brown spots I only have 3 very small ones and they where all lightened considerably. 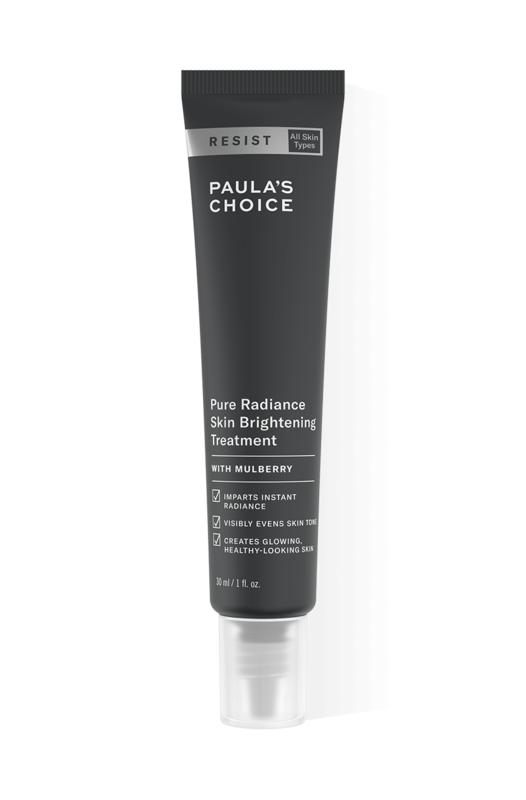 I sadly do have darker patches of brown from what I now know is from sun damage, this product significantly reduced those as well (along with some other Paula's choice product)! I was disappointed when I first saw how small the tube was, but was pleasantly surprised at how long it lasted. Even when I thought it was almost done, more product would appear out of the tube for many more applications. One last thing, this product has so many great ingredients, works well and thankfully is not that expensive which some of PC's products here in Europe are compared to in the US. In my opinion this product is very underrated. It contains a very impressive list of ingredients that double as melanin inhibitors and as great antioxidants. So it does have the potential to lighten-up skin. But remember, melanin formation is inhibited. This does not mean that the existing melanin is wiped-off, so do not expect any early results. Just know that you are doing something that in the long term might help with pigmentation.If you have a specific target problem, maybe a prescription product will serve you better. In my opinion we do not need an additional serum with this, since there are plenty of antioxidants in this product. Also, Paula's products, in my opinion, fall short on niacinamide. It is hard to find a good formulation with a big punch of niacinamide for dry skin. This product has it. I have a lot of discolorations from past acne and I know niacinamide always helps. But it is also a great anti-aging ingredient. In my skin, two months into using this I felt my acne marks were less visible, the new ones never became as dark. This also has a good creamy texture. Often I do not need a moisturizer over this. This product has a real good silky feeling when applied to skin. It's really comfortable to wear but I don't think It works for brightening skin, at least in the real way. Ok it has such effect but it's only cosmetic because It didn't help to fade little (very little) brown spots from sun or little acne scars. Although I also tried the "RESIST Skin Transforming Multi-Correction Treatment with Azelaic Acid + BHA" and it didn't work yet, but I think that one works better than this "RESIST Pure Radiance Skin Brightening Treatment". Probably my little spots or acne scars are so tiny that I don't need this kind of products yet, but I wanted to try it. I bought this to get rid of a couple of brown spots. Unfortunately, I see no difference after a month's use. Perhaps all that could be done has already been done by my existing Paula's regime (bha in the morning, aha and retinol in the evening). The product itself is very pleasant to use. It's just not doing what I needed it to do for me.